On CD Rom. Delivered FREE anywhere in the world direct from the supplier. PUBLISHED IN 4 PARTS (2 VOLUMES) BETWEEN 1840 AND 1841. 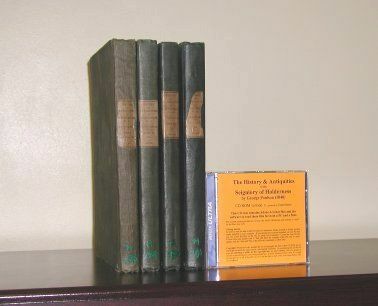 The 4 books were published seperately in the years 1840 to 1841. They contain a total of over 1,100 pages split into 2 volumes. The books have become very rare and sell for over £300 in good condition (which makes £20 a bargain!). The books were originally started by the Rev. William Dade (he of the "Dade Registers"), but he died before really getting started with the text but he did leave manuscripts and he did get some of the engravings made. The job of producing the book was taken over (with some difficulty) at a much later date by George Pouson, the results of his efforts you see in these books. There are numerous family Pedigrees of the leading families of Holderness, some from the time of William the Conqueror, detailed histories of each parish with plates of most of the churches and lists of the incumbents. The plates include a map of the Wapentake of Holderness, and very detailed maps of Barmston and Hornsea Mere etc. This CD rom version of the book contains an index which uses active links on each entry in the index to navigate to the relevant page. i.e. clicking on the text or the page number will take you to the given page. There are also extensive navigation panes set up for each volume to further assist in navigation of the books. Please note that although these volumes cover the parishes of Marfleet, Sutton upon Hull and Drypool, they do not cover Kingston upon Hull. Click here to view a transcription of the Index.